Phil Zimmerman ("Zim") and a man identified only as "Cy" appear on horseback in this photo, possibly taken in the fall of 1912. Displayed prominently across their legs is a sign bearing the messages "Ocean-to-Ocean Relay: All The Way" and "Hagstrom Spark Plugs." The latter refers to a product of the Hagstrom Brothers Manufacturing Company in Lindsborg, Kansas. Zimmerman, on the right, worked for Hagstrom's at the time. In the photo, he also holds an umbrella advertising Good Year motorcycle tires. 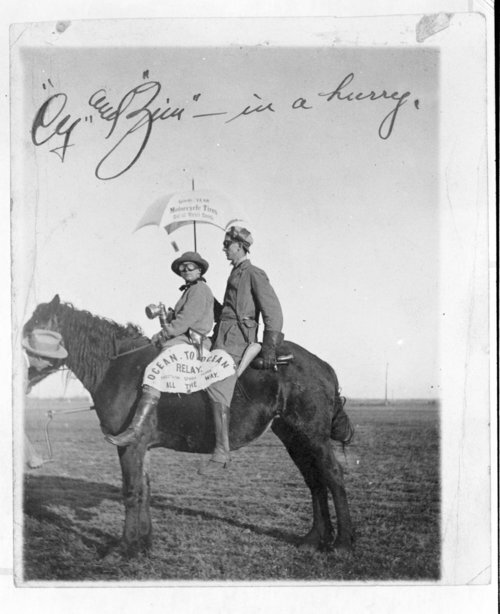 The photo carries a handwritten inscription: "'Cy' and 'Zim' -- in a hurry." "Ocean-to-Ocean Relay" refers to a transcontinental motorcycle relay which was planned by the Federation of American Motorcyclists, but did not take place. The first riders in the relay were to leave New York City on October 20, 1912 carrying a "special message from the War department." The message was to be delivered through a succession of motorcyclists in "record-breaking time" to a destination in San Diego. Just days before the relay was to start, the federation announced that it was cancelling the event because of poor road conditions. A later news report suggested that internal conflicts over a proposal to award sponsorship to a single motorcycle manufacturer also contributed to the decision. Plans to reschedule the relay for the spring of 1913 apparently did not materialize. The president of the Federation of American Motorcyclists at the time was Benjamin J. Patterson, a physician and avid motorcyclist from Pratt, Kansas. Two years earlier, in 1910, Patterson founded the Short Grass Motorcycle Club while still a resident of Rexford, Kansas. The Short Grass club enjoyed a measure of national prominence, largely because of several long-distance tours it sponsored into Colorado and Wyoming between 1910 and 1915. Phil Zimmerman was the club's secretary-treasurer. Phil Zimmerman ("Zim") and a man identified only as "Cy" appear on horseback in this photo, possibly taken in the fall of 1912. Displayed prominently across their legs is a sign bearing the messages "Ocean-to-Ocean Relay: All The Way" and "Hagstrom Spark Plugs." The latter refers to a product of the Hagstrom Brothers Manufacturing Company in Lindsborg, Kansas. Zimmerman, on the right, worked for Hagstrom's at the time. In the photo, he also holds an umbrella advertising Good Year motorcycle tires. The photo carries a handwritten inscription: "'Cy' and 'Zim' -- in a hurry." "Ocean-to-Ocean Relay" refers to a transcontinental motorcycle relay which was planned by the Federation of American Motorcyclists, but did not take place. The first riders in the relay were to leave New York City on October 20, 1912 carrying a "special message from the War department." The message was to be delivered through a succession of motorcyclists in "record-breaking time" to a destination in San Diego. Just days before the relay was to start, the federation announced that it was cancelling the event because of poor road conditions. A later news report suggested that internal conflicts over a proposal to award sponsorship to a single motorcycle manufacturer also contributed to the decision. Plans to reschedule the relay for the spring of 1913 apparently did not materialize. The president of the Federation of American Motorcyclists at the time was Benjamin J. Patterson, a physician and avid motorcyclist from Pratt, Kansas. Two years earlier, in 1910, Patterson founded the Short Grass Motorcycle Club while still a resident of Rexford, Kansas. The Short Grass club enjoyed a measure of national prominence, largely because of several long-distance tours it sponsored into Colorado and Wyoming between 1910 and 1915. Phil Zimmerman was the club's secretary-treasurer.